Everybody knows the story of the duchess. In November, 2010, William the proposal of marriage and spends her ring of her mother, a 18 carat sapphire was surrounded with 14 diamonds. She became member of the British royal family by alliance, since her marriage in April, 2011 with the young prince William. Appeared in an entitled article ” Kate Middleton, even thinner than Victoria Beckham at the same stage “, the magazine asserts that after four months of pregnancy, the duchess of Cambridge did not still take one gram, and reminds that everybody expected to see the woman of prince William with some curvatures, just two months after the confirmation of its pregnancy. A false coat is to be afraid of respect Public who regrets that Kate Middleton submits himself to the diktat of the size 0, following in it Victoria Beckham among whom ” we wondered where she could well hide her baby “. We see nothing on the horizon. The stomach is indefatigably flat; a stomach formerly greeted by the fans of fashion becomes cause for concern today. Kate Middleton’s eating disorders are pointed. According to her close relations, Kate did not gain weight during her pregnancy because she pays attention that she eats and what to get fat, it is her obsession. The same friend asserts that the latter would refuse to follow the diet in 3000 calories a day recommended by the doctor to her release of the hospital last December. She does not exceed 1500 calories a day and refuses systematically food fat, according to the source. Increase of the sales of tests of ovulation and pregnancy in the United Kingdom. Everybody became used to it, after each of Kate Middleton’s public appearances; the sales of ready-to-wear clothing explode. Women of whole world want to look like her and are ready to succeed there in making madness’s of their credit card. 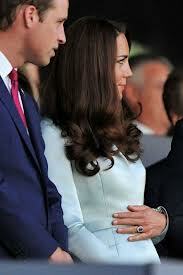 But maintaining that the wife of Prince William is pregnant, the mimetic madness goes farther. More than a dress or a pair of low-fronted shoes, it is from now on the baby whom English want to welcome in their home. After the princess announced to be pregnant, the sales of tests of ovulation and pregnancy increased by more than 50 % in the United Kingdom. Indeed since the official announcement of its pregnancy one month ago, the sales of test of ovulation and pregnancy increased by more than 50 % in the United Kingdom. It is necessary to say that there has been never such an increase previously according to a person in charge of a mark specialist of pregnancy test and he asserts that they were very amazed by discovering the statistics and those they noticed that the peak had taken place just after Kate’s announcement. The British so much wish to look like their new icon, which they try to have a baby to live their pregnancy at the same time as that of Kate and to match the round stomach and their morning nausea to those of the Duchess. Not satisfied to have made inflate the textile economy, Kate Middleton thus gets ready to cause a demographic increase.